Fishergate is the main shopping street in Preston. The shops stretch from the railway station to the Miller Arcade or Tithebarn Street. Includes Marks and Spencers, Laura Ashley, Next, Waterstones, Boots, Cotswold and a lot more. The Fishergate Centre is a smallish, modern shopping centre on 2 levels next to the railway station containing Debenhams, Primark, TK Maxx, Argos, Starbucks and quite a few other small shops. St Georges Shopping Centre is medium sized about 250 yards from the railway station. This has been refurbished and is quite well done. Contains a lot of smaller shops. Miller Arcade is an excellent ornate Victorian building containing shops. A Rohan and in 2015 a restaurant and bar. Also a game shop. Friargate is the second main shopping street and has shops on mosti of its length. The main ones are near the Fishergate end. The shops beyond the Ring Road are generally smaller. The covered market, notable for it's Victorian large area of unsupported roof, has stalls several days a week and next to it is the Market Building with food, meat and fish. St Johns Shopping Centre between the covered market and bus station has a number of small shops. The Guild Hall Shopping Centre has a Tourist Information Office and a number of small shops. Winckley Street almost opposite the Mall has a couple of pleasant cafe's and a Pizza Express. There is also a Paul Heathcote, The Olive Press in Winckley Square which serves lunch. 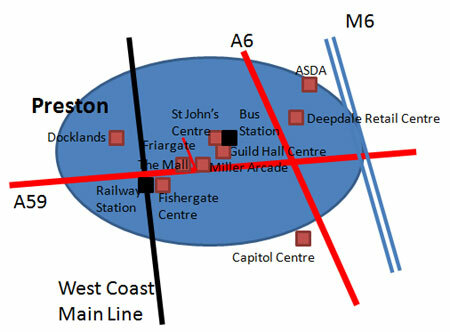 Preston has 2 out-of-centre shopping areas and one just over the southern border. These are Deepdale Shopping Centre has a number of decent stores, M&S, Next, sports shops, PC World, Currys, eateries and more. The Dockland for Morrisons, Homebase, DFS and a few others. ASDA at Fulwood. The Capitol Centre on the A6 just over the border in Walton Le Dale contains Currys, Next and quite a few others. Overall Preston isn't a bad centre for shops although updating this page has needed a lot of deletions due to closures.